Cross-laminated timber (CLT) is a proprietary engineered wood product that is prefabricated using several layers of kiln-dried lumber, laid flat-wise, and glued together on their wide faces. Panels typically consist of three, five, seven or nine alternating layers of dimension lumber. The alternating directions of the CLT laminations provide it with high dimensional stability. CLT also has a high strength to weight ratio, along with exhibiting advantages for structural, fire, thermal and acoustic performance. Panel thicknesses usually range between 100 to 300 mm (4 to 12 in), but panels as thick as 500 mm (20 in) can be produced. Panel sizes range from 1.2 to 3 m (4 to 10 ft) in width and 5 to 19.5 m (16 to 64 ft) in length. The maximum panel size is limited by the size of the manufacturer’s press and transportation regulations. The design provisions for CLT in Canada apply to sawn lumber panels manufactured in accordance with the ANSI/APA PRG 320 standard. Typically, all the laminations in one direction are manufactured using the same grade and species of lumber. However, adjacent layers are permitted to be of different thickness and made of alternative grades or species. The moisture content of the lumber laminations at the time of CLT manufacturing is between 9 and 15%. 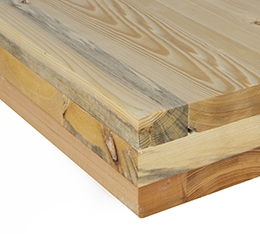 There are five primary CLT stress grades; E1, E2, E3, V1 and V2. Stress grade E1 is the most readily available stress grade. The “E” designation indicates machine stress rated (MSR, or E-rated) lumber and the “V” designation indicates visually graded lumber. Stress grades E1, E2 and E3 consist of MSR lumber in all longitudinal layers and visually graded lumber in the transverse layers, while stress grades V1 and V2 consist of visually graded lumber in both longitudinal and transverse layers. Properties for custom CLT stress grades are also published by individual manufacturers. Similar to other proprietary structural wood products, CLT can be evaluated by the Canadian Construction Materials Centre (CCMC) in order to produce a product evaluation report. Unlike primary and custom CLT stress grades which are associated with structural capacity, appearance grades refer to the surface finish of CLT panels. Any stress grade can usually be produced in any surface finish targeted by the designer. Accommodations for reductions in strength and stiffness due to panel profiling or other face- or edge-finishes must be made. The Appendix of ANSI/APA PRG 320 provides examples of CLT appearance classifications. Structural adhesives used in bonding laminations must comply with CSA O112.10 and ASTM D7247 and are also evaluated for heat performance during exposure to fire. Phenolic types such as phenol-resorcinol formaldehyde (PRF). Since pressure treatment with water-borne preservatives can negatively affect bond adhesion, CLT is not permitted to be treated with water-borne preservatives after gluing. For CLT treated with fire-retardant or other potentially strength-reducing chemicals, strength and stiffness is required to be based on documented test results. As part of the prefabrication process, CLT panels are cut to size, including door and window openings, with state-of-the art computer numerical controlled (CNC) routers, capable of making complex cuts with low tolerances. Prefabricated CLT elements arrive on site ready for immediate installation. CLT offers design flexibility and low environmental impacts for floor, roof and wall elements within innovative mid-rise and tall wood buildings.